Update: 5 Yep, it's BAAAACK! Mars Hoax rises Ugly, Gullible Head ONCE AGAIN for 2010! LOL...........It MUST be August! Update 4: July 10, 2009.....and AGAIN, and AGAIN, AND AGAIN WHEN WILL IT END? Probably won't ever end as long as people don't think before they send misinformation on to others or to other groups. PLEASE READ AND SEND THIS ON TO SOMEONE EACH TIME YOU HEAR THIS HOAX. UPDATE 3: August 3, 2007 AND.....HERE WE GO AGAIN! Will this crap NEVER END? For the last FOUR years, this email has surfaced. Its a LIE! Have you received any email messages about a close approach of Mars? How can people be so easily conned into thinking that Mars could EVER be seen as big as the Moon? It boggles my mind that anyone could do this, but sadly it's true. I have received essentially this same email 20 or more times in the last two years (now 3 years as of 08/15/06). It comes from friends and strangers alike. Those friends that understand that this is bogus laugh along with me, and those that don't know the difference we try our best to help them understand the truth about what's really happening. 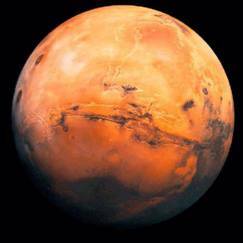 On August 27, 2003, Mars came closer to Earth than it had been in nearly 60,000 years. At 4:51 am that Thursday morning, Mars had closed the distance to only 34,646,418 miles away from Earth. From that moment onward it began pulling away again. It had also been close in 2001, as well as in 1988, and 1971. To be completely accurate, Mars comes close to Earth about every two years, or every 25.6 months. Mars is coming close to Earth again this November 7th, (2004) when it'll be "only" a little over 43,000,000 miles away. It will be better positioned for northern hemisphere observers all winter long this time. Mars and Earth both have elliptical orbits around the Sun. However, Earth's orbit is MUCH closer to being truly circular than Mars orbit, and due to this difference in our orbits we keep making these close approaches about every 780 days. This is something that can be called a cycle since it happens with a certain periodicity. We also share a couple other periodicities with Mars. There is a cycle that happens roughly every 15 years when we make an otherwise very close approach to Mars. Another little twist to this 15 year cycle concerns every third or fourth cycle when it's a 17 year period since the last close approach. There are other peculiarities about these cyclical orbital oddities that conspire to give us the rare passages like we had in 2003. But the record from 2003 will not be exceeded for 284 more years until 2287 A.D.! We have an excellent book in the AOAS library called, "More Mathematical Astronomy Morsels", by Jean Meeus, the world renowned mathematician who tinkers with these ultra-precise measurements of all things astronomical. These complex mathematical formulas that describe the periodicities above may be viewed in his book which paid members may check out if anyone is interested. But the whole point of this little story is to help everyone understand that when you receive another copy of this bogus and highly misinformed email, just reply to the sender and ask them to check out our AOAS.org website and this article. It's kind of funny, even silly to keep seeing this email message again and again, over and over, but it's a constant reminder of how many people don't understand what's going on in the solar system. This is a condition that AOAS is always trying to help remedy, and we hope that everyone will think of accessing our website for items regarding astronomical objects, reports and happenings. If we can't answer your questions immediately, we'll look up the answer and try to help you understand it for yourself as well. In the ultraviolet image on the left, from the Galaxy Evolution Explorer, galaxy IC 3418 leaves a turbulent star forming region in its wake. In the visible light image on the right (from the Sloan Digital Sky Survey), the wake with its new stars is not apparent. Next time you hike in the woods, pause at a babbling stream. Watch carefully how the water flows around rocks. After piling up in curved waves on the upstream side, like the bow wave in front of a motorboat, the water speeds around the rock, spilling into a riotous, turbulent wake downstream. Lightweight leaves or grass blades can get trapped in the wake, swirling round and round in little eddy currents that collect debris. Astronomers have found something similar happening in the turbulent wake of a tiny galaxy that is plunging into a cluster of 1,500 galaxies in the constellation Virgo. In this case, however, instead of collecting grass and leaves, eddy currents in the little galaxy’s tail seem to be gathering gaseous material to make new stars. “It’s a fascinating case of turbulence [rather than gravity] trapping the gas, allowing it to become dense enough to form stars,” says Janice A. Hester of the California Institute of Technology in Pasadena. The tell-tale galaxy, designated IC 3418, is only a hundredth the size of the Milky Way and hardly stands out in visible light images of the busy Virgo Cluster. Astronomers realized it was interesting, however, when they looked at it using NASA's Galaxy Evolution Explorer satellite. “Ultraviolet images from the Galaxy Evolution Explorer revealed a long tail filled with clusters of massive, young stars,” explains Hester. Galaxies with spectacular tails have been seen before. Usually they are behemoths — large spiral galaxies colliding with one another in the crowded environment of a busy cluster. Tidal forces during the collision pull gas and stars of all ages out of these massive galaxies to form long tails. But in IC 3418, the tail has just young stars. No old stars. Hester and eight coauthors published their findings in the June 10, 2010, issue of The Astrophysical Journal Letters. The team described the following scenario: IC 3418 is speeding toward the center of the Virgo cluster at 1,000 kilometers per second. The space between cluster galaxies is not empty; it is filled with a gaseous atmosphere of diffuse, hot hydrogen. Thus, like a bicyclist coasting downhill feels wind even on a calm day, IC 3418 experiences “a stiff wind” that sweeps interstellar gas right out of the little galaxy, said Hester—gas that trails far behind its galaxy in a choppy, twisting wake akin to the wake downstream of the rock in the babbling brook. Eddy currents swirling in the turbulent wake trap the gas, allowing it to become dense enough to form stars. To many astronomers, that’s a surprising tale indeed. See other surprising UV images from the Galaxy Evolution Explorer at http://www.galex.caltech.edu. Kids (and grownups) can play the challenging new Photon Pileup game at http://spaceplace.nasa.gov/en/kids/galex/photon/. With the Moon just past full this weekend, much of the deep sky will be difficult to observe, and the Moon itself is so bright that much of the detail will be lost in the glare. However, that doesn't mean we have to throw in the towel and stay indoors. There are plenty of celestial targets still available for summer observing. Jupiter rises well below the Moon about an hour after dark. Although they look close together, Jupiter will be 1,500 times farther from us than the Moon is when they pass on the 26th and 27th. A small telescope or larger binoculars will reveal Jupiter's Galilean Moons. The positions of these moons change from night to night, so a planetarium program or online Galilean Moon Graph utility is essential for identifying these four Jovian satellites. Uranus is only about 2° west of Jupiter. In a telescope Uranus is only 3.7 arcseconds wide, compared to Jupiter's unusually wide 48 arcminutes. Uranus can be hard to spot. Look for a greenish-white object that is slightly more disk-like than the surrounding stars. Beginning mid-week, look low in the west-southwest during twilight. Here, Venus forms the bottom of an upside down flat, symmetrical triangle with much fainter Mars and Spica a little higher. By now, Saturn has moved far off to Venus' right or lower right. 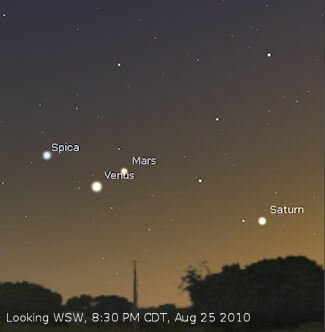 By Monday, the Venus-Spica-Mars triangle distorts significantly as Venus moves closer to Spica. Don't forget as well that although the Moon is bright and the deep sky is washed out, The International Space Station still presents a bright target for night sky observers. On Wednesday at 8:30 PM CDT, the ISS should pass high overhead in the SE at an altitude of 50°, shining brightly at magnitude -3.4. The ISS makes several more passes this week, though none is as bright as this one. On Thursday, look for the ISS at 8:57 PM CDT, as it passes a little less than halfway up the sky (34°) in the NW, reaching magnitude -1.9. On Saturday evening, look for it at 8:17 PM CDT, this time just a bit lower in the NW at altitude 29°. The ISS will shine a bit less brightly at magnitude -1.5. The ISS passes overhead just about every night this week, but these are the brightest. Also this week, Iridium 3 flares to magnitude -2 in the early morning hours on Friday at 5:21 AM CDT. Look for the Iridium 3 flare at an altitude of 52° in the SW. Iridium 76 flares to a stunning magnitude -8 early on Saturday morning at 5:15 AM CDT, also at 52° altitude in the SW. Sunday evening, Iridium 7 will flare to magnitude -1 at 9:37 PM CDT. Look for it low on the northern horizon at an altitude of 12°. Check the charts at Heavens Above to find out when and which direction to look to catch the both the ISS and Iridium Flares. This week, the planets Mercury, Venus, Mars, and Saturn continue to mark a nice straight line along the ecliptic, with Mercury in the lead as they sink into the western horizon. Mercury will set very soon after dusk, so you will have to watch carefully as the sun sets to catch it. 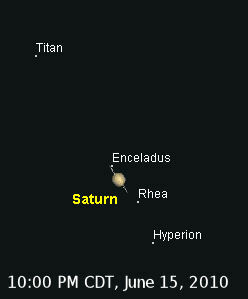 On Friday evening, Saturn's largest moon, Titan, is below and to the right of the Ringed Planet this evening. A small telescope will show it at magnitude 9. 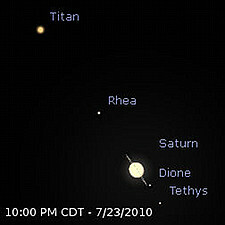 In the image at left, Titan is above and to the left of Saturn, which is the orientation that matches the mirror-reverse image found in a refracting telescope. Titan orbits Saturn every 16 days, so you can watch it swing from one side of Saturn to the other over a bit more than a two week period. Saturn's Rings, have widened a bit in the last several weeks to 3° from edge-on, even as the planet recedes from Earth. 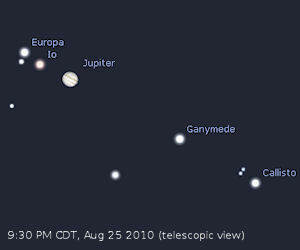 Jupiter is at magnitude –2.6, in the constellation Pisces this week, and it rises around 12 AM CDT. Jupiter shines as the bright “Morning Star”, high in the southeast in the early morning hours before dawn. Jupiter's smaller, more distant cousin, Uranus is within 3° of the King of Planets at magnitude 5.8. In a telescope, Uranus is a tiny 3.6 arcseconds wide, compared to Jupiter's 44 arcminutes. 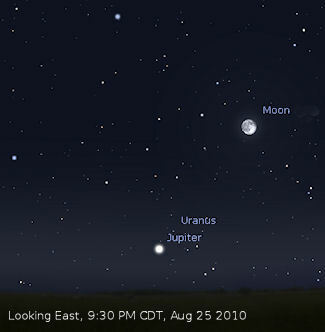 Uranus will be hard to spot with the Moon reaching its Full phase by 8:37 PM CDT Sunday evening, July 25th. The latter part of this week, Thursday and Friday evenings are a good time to look at some of the Moon's more prominent features. Most visible in small telescopes are the lunar maria (MAR-ee-ah,) or seas. These are darker areas, or plains on the surface of the Moon that stand out from the surrounding terrain because of their apparent smoothness and lack of albedo, or reflectivity. These maria are actually areas where basaltic lava has been laid on the lunar surface by volcanic activity. Other prominent features include craters and mountain ranges. Copernicus and Tycho are very prominent craters since they both have relatively high albedos and are surrounded by ray systems, which are the remnants of ejected lunar material due to impacts. Other prominent craters include Ptolemaeus, Plato, Hercules, Atlas, and Endymion. Prominent mountain ranges include Montes Apenninus, Montes Caucasus, Montes Carpatus, and Montes Riphaeus. These mountain ranges are the rough edges that remain from huge, ancient impact craters. The study of the surface and physical features of the Moon is known as Selenography, which is concerned not with geology so much as lunar mapping and the naming of lunar features. Although there had been earlier attempts to draw maps of lunar features. including a map by Michel Florent van Langren in 1645, the first real lunar atlas was produced by Johannes Hevelius in 1647 and titled Selenographia. 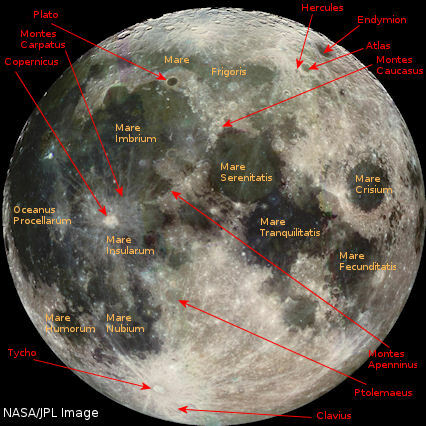 Van Langren's map and the name of lunar features had distinctly Catholic origins, where Hevelius' work corresponded to features on Earth and on the Greek and Roman civilizations. If you're interested in Selenography, you should check out Virtual Moon Atlas, which is a great free software download you can use to learn about lunar features. 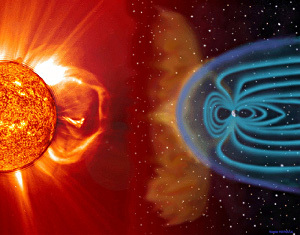 In spite of Earth’s protective magnetosphere, solar storms can wreak havoc with Earth satellites and other expensive electronics on the ground. Grab your cell phone and take a good long look. It's indispensable, right? It tells time, surfs the web, keeps track of your appointments and, by the way, also makes phone calls. Modern people can hardly live without one. One good solar flare could knock it all out. “In the 21st century, we’re increasingly dependent on technology,” points out Tom Bogdan, director of NOAA's Space Weather Prediction Center in Boulder, Colorado. “This makes solar activity an important part of our daily lives.” Indeed, bad space weather can knock out power systems, telecommunications, financial and emergency services—basically, anything that needs electronics to work. That’s why NOAA is building a new fleet of “space weather stations,” the GOES-R satellites. NOAA's existing fleet of Geostationary Operational Environmental Satellites (GOES) already includes some space weather capabilities: solar ultraviolet and X-ray telescopes, a magnetometer and energetic particle sensors. GOES-R will improve upon these instruments and add important new sensors to the mix. One of Bogdan’s favorites is a particle detector named “MPS-Low,” which specializes in sensing low-energy (30 ev – 30 keV) particles from the sun. Who cares about low-energy particles? It turns out they can be as troublesome as their high-energy counterparts. Protons and other atomic nuclei accelerated to the highest energies by solar flares can penetrate a satellite’s exterior surface, causing all kinds of problems when they reach internal electronics. Low-energy particles, particularly electrons, can’t penetrate so deeply. Instead, they do their damage on the outside. The Galaxy 15 communications satellite stopped working during a solar wind storm in April 2010, and many researchers believe low-energy particles are to blame. GOES-R will be able to monitor this population of particles and alert operators when it’s time to shut down sensitive systems. “This is something new GOES-R will do for us,” says Bogdan. The GOES-R magnetometer is also a step ahead. It will sample our planet’s magnetic field four times faster than its predecessors, sensing vibrations that previous GOES satellites might have missed. Among other things, this will help forecasters anticipate the buildup of geomagnetic storms. They might also be able to answer the question, Is my cell phone about to stop working? The first GOES-R satellite is scheduled for launch in 2015. Check www.goes-r.gov for updates. Space weather comes down to Earth in the clear and fun explanation for young people on SciJinks, http://scijinks.gov/space-weather-and-us. Wednesday evening will be a good time to look for a thin crescent Moon below Venus in the fading western sky. At 9:00 PM CDT, the waxing crescent Moon will be about 7° to the lower left of brilliant Venus. Also on Wednesday evening, look for the International Space Station (ISS) to make a fairly bright overhead pass starting at 9:31 PM CDT. Look for it low in the NW, and then watch it swing up to an altitude of 57° in the SW before fading into the horizon in the SSE. 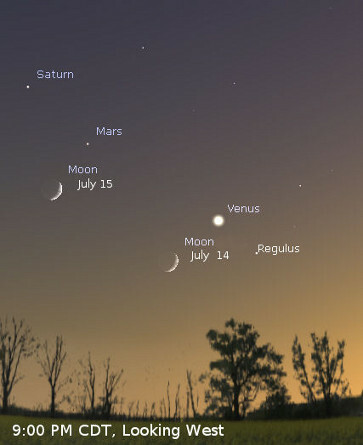 On Thursday evening, July 15th, the Moon is farther left of Venus. Now they both appear to be close to the same altitude above your horizon. Also on Thursday, Saturn's largest satellite, Titan, is at its eastern elongation from the planet this evening, and should be easy to pick out in a small telescope at high power. By Friday evening, the Moon has moved far to the left of Mars and Saturn. Iridium 25 makes a bright pass overhead on Saturday evening at 9:41 PM CDT. Look for it to flare to magnitude -6 at an altitude of only 14° above the horizon in the NNW. There are several more Iridium Flares occurring this week, all in the early morning hours. You can find out the times and directions of Iridium Flares and ISS passes at Heavens Above. Look for the bright stars Vega, Deneb, and Altair, the apices of the Summer Triangle in the eastern sky soon after dusk. This week, the Summer Triangle asterism will slightly higher in the sky than it was at the same hour last week. There are several Messier objects to be found within the Summer Triangle. These are wonderful jewels that can be captured by a pair of binoculars or a small-to-medium (6” - 10”) telescope. If you want to learn more about these jewels of the night sky, check out this Astronomy From Your Backyard PDF file. If you want to actually see these objects in a telescope, come to the AOAS Star Party this Saturday, July 17th at Lake Fort Smith State Park, weather permitting. We will be holding a presentation in the Visitor Center at 8:00 PM, CDT, and then we'll move to the boat ramp area where we will have club members and their telescopes set up for public viewing. Come on out and enjoy the night sky! This week, look for Venus shining bright in the western sky at dusk. Venus moves lower in the sky every week as the year marches on. In the evening on Saturday, July 10th, look for Regulus straight below Venus. Regulus is 150 times dimmer than Venus, and is very close to it — only about 1.2°. On Sunday, July 11th, the New Moon occurs exactly at 2:40 PM. CDT. Mercury and the thin crescent Moon are far to the lower right of Venus in early evening Sunday, and visible only at locations with a clear view to the west. Catching them together will require some searching and the aid of a pair of binoculars. Sunday evening, Mercury and the Moon will be about 10° apart at dusk. After Sunday, the waxing crescent Moon moves along a diagonal line south of the one described by Mercury, Venus, Mars, and Saturn. The planets lie on, or very close to the ecliptic, which is the plane of the Solar System. Watch each evening, and you will see the Moon higher and farther south than the night before, while the Crescent grows fatter until it reaches First Quarter at the end of next week. With the darker skies due to the New Moon, this week is also a great time to look for objects in the deep sky. Deep sky objects are objects in the night sky other than individual stars and the planets of our own Solar System. The deep sky is rich with star clusters, various type of nebulae, galaxies, and supernovae remnants. In mid-summer, Scorpius is high in the south after dusk, and the Scorpion's Tail is only visible for a short window of time during this part of the year. Scorpius is one of the most recognizable constellations in the sky, since it so closely resembles its namesake. The Scorpion's Tail is an area rich in deep sky objects, and is a great place to spend some time browsing with a telescope or binoculars. 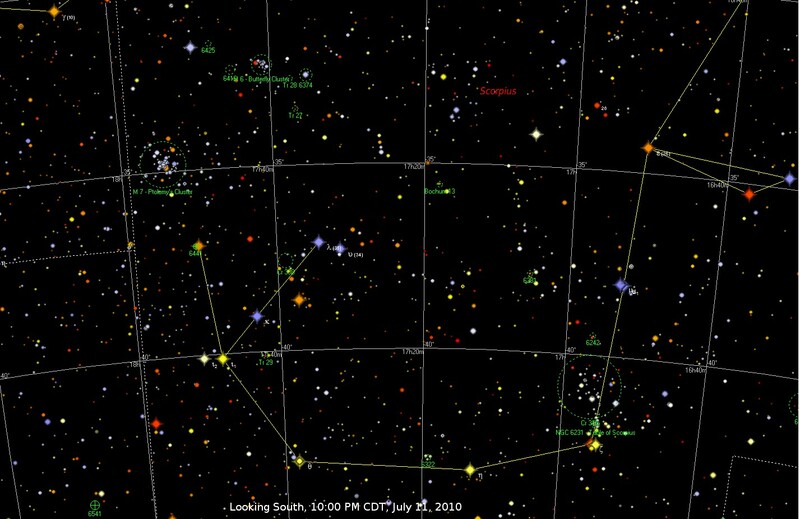 Look for Messier objects M7, the Ptolemy Cluster, and M6, the Butterfly Cluster, in the area above and to the east of the tip of the Scorpions Tail. 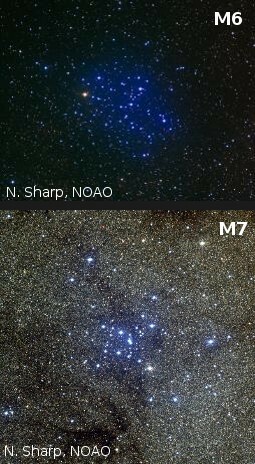 A bit higher, in the body of the Scorpion, lies M4, a brilliant globular cluster, and one of the jewels of the night sky. There are also many objects from the NGC, or New General Catalogue visible in the Scorpion's Tail as well. Open clusters NGC 6383, NGC 6425, NGC 6416, NGC 6242, NGC 6281, NGC 6231, NGC 6322, and NGC 6250 are in the Tail, as well as globular clusters NGC 6441, NGC 6338, and NGC 6541. Click this link for a finder chart. You can spot 1 Ceres any night this week as it moves through the constellation Ophiuchus (pronounced Oh-FEE-eh-kuss) with binoculars or a small scope. Ceres, the largest astronomical body in the asteroid belt, was discovered on Jan 1, 1801 by Giuseppe_Piazzi. After having been designated as a planet in 1801, Ceres enjoyed that elevated status for only a short time, until a number of other small objects were discovered in the space between Jupiter and Mars. In 1802, William Herschel coined the term asteroid ("star-like") to refer to these small bodies — bodies that were too much like stars to be planets, but wandered in the same way. Ceres was reclassified as a dwarf planet after the status of Pluto was debated and demoted in 2006. Ceres is now the smallest dwarf planet in the Solar System, rather than the largest asteroid, but remains designated formally as 1 Ceres since it was the first such body to be discovered. 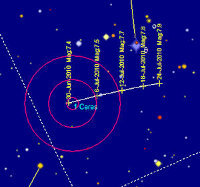 1 Ceres is currently still as bright as magnitude 7.3, and can be located by using the finder chart. The best way to distinguish Ceres from the background stars is to observe it on several different nights. The obvious movement from night to night compared to the background will give it away. Some very bright Iridium Flares may be visible this week! On Wednesday evening, June 30th, Iridium 26 will flare to a magnitude of -3.0 in the WSW at 11:36 PM CDT. Look for it at an altitude of 19° above the horizon. Any time we refer to magnitude in this article, we are actually referring to apparent magnitude, which is how the brightness of an object appears to observers on Earth, as opposed to its intrinsic brightness, or absolute magnitude. In the early morning hours of Thursday, July 1st, you may be able to catch Iridium 12 flaring to a very bright magnitude -7.0 at 4:16 AM CDT, 27° above the horizon in the ESE. Iridium 23 also flares to a brilliant -7.0 magnitude on Thursday evening at 11:30 PM CDT. Look for it at an altitude of 19° in the WSW. A magnitude of -7.0 is several orders of magnitude brighter than Venus at its brightest! Venus only reaches -4.67 when it is in it s crescent phase and closest to Earth. So these flares will be very bright. Another pair of bright Iridium Flares appropriately occur on Independence Day, Sunday, July 4th. At 4:04 AM CDT in the ESE, look for Iridium 91 at 23° above the horizon, flaring to a -4.0 magnitude. Again at 11:21 PM in the WSW, Iridium 22 hits magnitude -6.0 at altitude 18°. Finally, look for Iridium 56 and Iridium 41 in the early morning on Tuesday, July 6th flaring to -5.0 and -7.0 in the SE at 28° and the E at 12° respectively. Iridium 56 will flare at 3:54 AM CDT and Iridium 41 at 5:14 AM, CDT. The International Space Station (ISS) makes only one pass low in the NNW this week, starting at 11;56 PM CDT on Monday, July 5th. The ISS starts at altitude 10° in the NNW, then barely swings up to a maximum altitude of 11° in the NNW, and quickly fades from view. 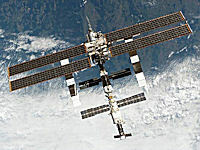 The ISS will only reach a maximum brightness of magnitude 0.0, or just slightly brighter than Vega in the constellation Lyra at magnitude 0.03. Venus closes in on Regulus in the constellation Leo day by day, while Mars closes in on Saturn. The diagonal line of Saturn, Mars, Regulus, and Venus is shrinking every day. 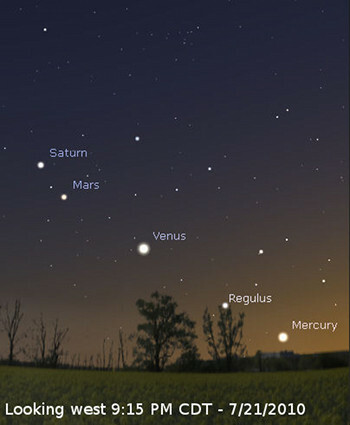 The three planets will be very close together low in the west at sunset by early August. A telescope shows Saturn's Rings a mere 2° from edge-on right now, but the rings will continue to increase their tilt with respect to Earth over the next 15 years. As night falls this time of year, look for red Arcturus high in the southwest straight above Spica in the constellation Virgo. 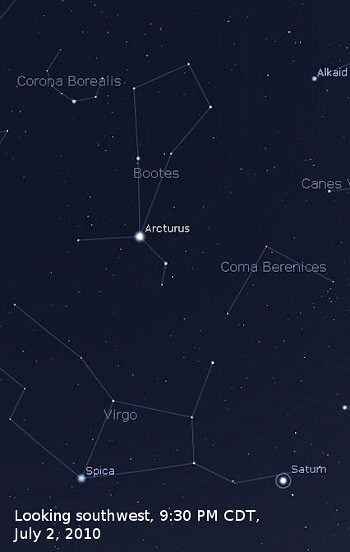 The kite shape of the rest of the constellation Boötes extends straight up from Arcturus. By the way, Boötes is pronounced "Bo-OH-teez" or "Bo-OH-tiss," not "BEWT-eez", as some might assume. Pronunciation of constellation names is open to debate, but there are several accepted pronunciations for most constellations. If you're interested, See the Sky & Telescope magazine web site for a Pronunciation Guide. The waxing gibbous Moon lies in the head of the constellation Scorpius after dusk on Wednesday evening. Reddish-orange Antares is still bright, riding below and to the Moon's lower left. On Thursday evening, Antares and the upper part of Scorpius lie to the right of the nearly full Moon after dusk. 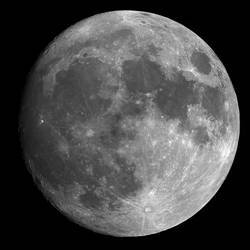 June's Full Moon occurs on Saturday morning at 6:31 AM which will be after daylight begins. The first Full Moon of June is known as the Strawberry Moon, so named by the Algonquin tribe because the relatively short season for harvesting strawberries comes each year during the month of June It is also known as the Flower Moon or Planting Moon. Observers in most of North America will also be able to witness a partial Lunar Eclipse on Saturday morning when the Moon will be setting in Sagittarius as the Sun rises. For observers in our neck of the woods, the Moon will be entering the penumbra at around 4:30 AM, and then will enter the actual eclipse phase by 5:17 AM. For observers in Arkansas, the Moon will be below the horizon before it reaches the maximum point of the eclipse. 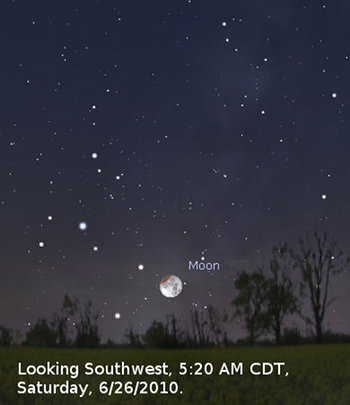 The image at left shows the Moon just starting to enter the umbra as it begins to set at 5:20 AM CDT. Venus is in the constellation Cancer at magnitude -4.0 and is still the bright Evening Star, shining in the west-northwest during and just after twilight this week. While Venus sinks in the west, Mars shines at magnitude +1.3 to Venus' upper left, a match in brightness for Regulus in Leo. The contrast in color between reddish Mars and blue-white Regulus is obvious to observers at darker-sky viewing sites. 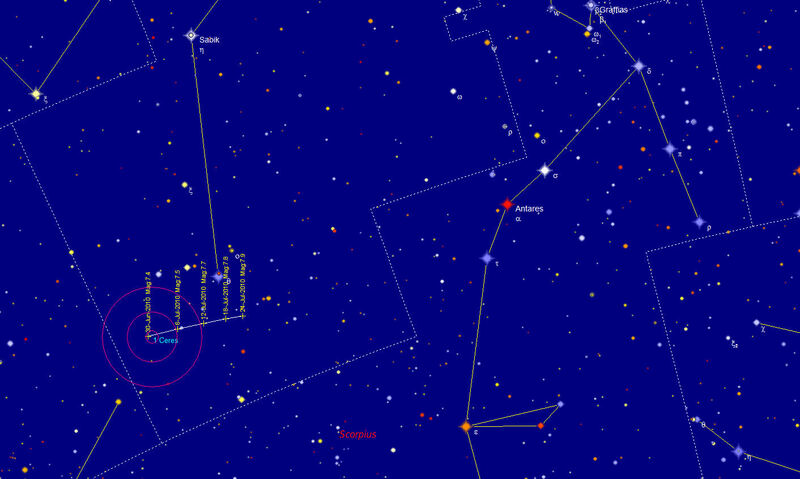 Regulus is falling farther to Mars' lower right each evening. The star to the upper right of Mars and Regulus is Gamma Leonis, which is only a little dimmer than these two. Jupiter is now rising around 1:00 AM CDT this week along with the constellation Pisces, and shines high in the southeast before dawn. 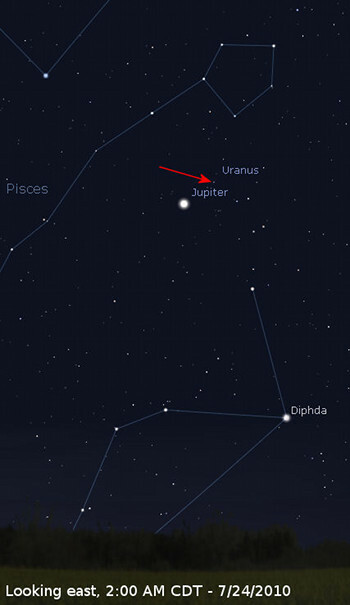 Nothing else in the sky at that time of night is as bright as Jupiter at magnitude -2.28. Jupiter's Great Red Spot is still free of the missing South Equatorial Belt for telescopic observers. Saturn glows in the south west during evening, to the upper left of Mars. 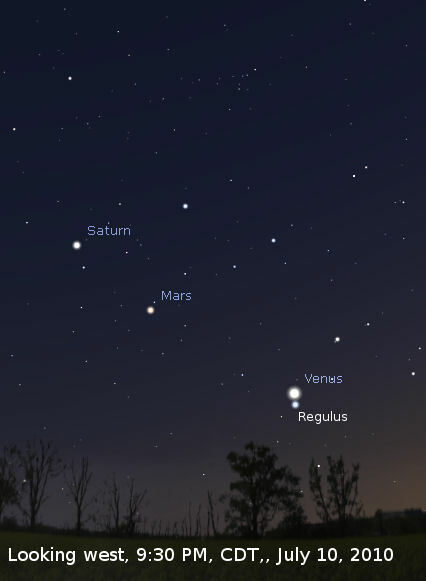 The diagonal line of Saturn, Mars, Regulus, and Venus, is shrinking; the three planets will bunch up low in the sunset in early August. 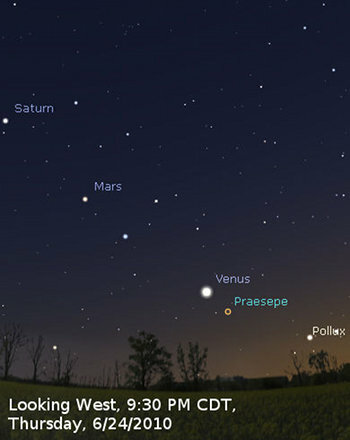 This week right after dusk, you can catch Saturn, Mars, Regulus, Venus, Praesepe (the Beehive Cluster,) and Pollux in a single diagonal line drawn down the western sky. Saturn's Rings are tilted 2° from edge-on in a telescope. Note the thin black shadow-line that the rings cast on Saturn's globe. The tilt of the rings will steadily increase over the next 15 years so that we can see more and more of the rings. As they tilt farther, observers with small telescopes will be able to see the Cassini Division, a thin dark band in the rings first observed by Giovanni Cassini in 1875. Black hole humor—you gotta love it. Unless you’re an astronomer, that is. Black holes are among the most mysterious and influential objects in the cosmos, yet astronomers cannot see into them, frustrating their attempts to make progress in fields ranging from extreme gravity to cosmic evolution. 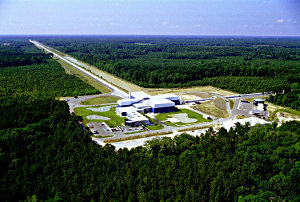 Enter LIGO—the NSF-funded Laser Interferometer Gravitational-wave Observatory. According to Einstein’s Theory of General Relativity, black holes and other massive objects can emit gravitational waves—ripples in the fabric of space-time that travel through the cosmos. LIGO was founded in the 1990s with stations in Washington state and Louisiana to detect these waves as they pass by Earth. So far the results are … nil. Researchers working at dozens of collaborating institutions have yet to report a definite detection.